In a little over one month, a new administration will have the opportunity to manage a significant realignment of U.S. defense and national security priorities. To be sure, this process will not occur in a vacuum. Today’s security imperatives and budgetary realities will require the next administration to make hard decisions and difficult trade-offs on competing visions of the military and its role in implementing national security strategy. These trade-offs will have wide-ranging consequences for the size and structure of the force, and what procurement and modernization options are feasible in order to advance overall U.S. national security interests. In order to make these important decisions, the next administration will first have to evaluate the current state of the military; examine the current composition of the Defense budget; and define the threats, challenges, and role of the U.S. military in the 21st century. This report is intended not only to serve as a playbook for a new administration and military planners. It also aims to guide policymakers and the general public about what a new administration will need to do to restore American military power while reorienting the military to more effectively and efficiently counter current and future threats. The next administration will inherit a vastly different military than the one bequeathed to President George W. Bush in January of 2001. After nearly six years of war in Iraq and over seven in Afghanistan, the next administration will have to contend with two wars, a military readiness crisis, recruitment and retention problems, mounting equipment shortages, and an out-of-control defense acquisition process. A new administration will also inherit a defense budget that is increasingly out of control. Gordon Adams, the former associate director for national security and international affairs at the Office of Management and Budget, said it well when he recently stated that, “It’s increasingly clear that Defense Department leadership has moved into a totally unconstrained view of military spending.” It is common knowledge that DOD spending is more in inflation-adjusted dollars today than at any other time since the end of the World War II, but this fact obscures the dramatic increase in defense spending of recent years. Adding the funding for the wars in Iraq and Afghanistan to the fiscal year 2009 base defense budget brings that sum in real dollars to nearly twice the amount spent for defense only eight years earlier. Soaring defense budgets have paradoxically failed to create a larger, more ready force. In fact, today’s force is smaller, older, and significantly more engaged than at any time since the Vietnam War. This situation has materialized despite the fact that, over the past eight years, the services have received $770 billion in their base budgets above and beyond what they planned on receiving in 2000. As many defense analysts have noted, large increases in the service’s base-budget spending have made the Pentagon’s problems worse. A budget devoid of spending limits and priorities has created an environment where the services have not had to make trade offs or difficult decisions when it comes to operations and support, and acquisitions programs. Undeterred, a number of organizations and individuals, including the chairman of the Joint Chiefs of Staff, Admiral Michael Mullen, have begun to call on lawmakers and Pentagon leaders to permanently allocate a minimum of 4 percent of U.S. gross domestic product to the base defense budget. Under their plan, Congress would continue to allocate supplemental funding for the wars in Iraq and Afghanistan, which has been the practice over the last seven years, above and beyond the initial 4 percent. Moreover, this approach to military spending is not based on future threats, does not set priorities, and does not deal with today’s budgetary realities. The United States is currently spending 4.2 percent of GDP on defense, including war funding, and the baseline defense budget currently consumes 3.4 percent of GDP. Yet the rationale behind putting a 4 percent floor under the baseline defense budget is without merit. Put simply, just because we can, does not mean that we should. Embrace a new vision for the U.S. military. Operations in Afghanistan and Iraq have highlighted the changing threat environment for the United States. 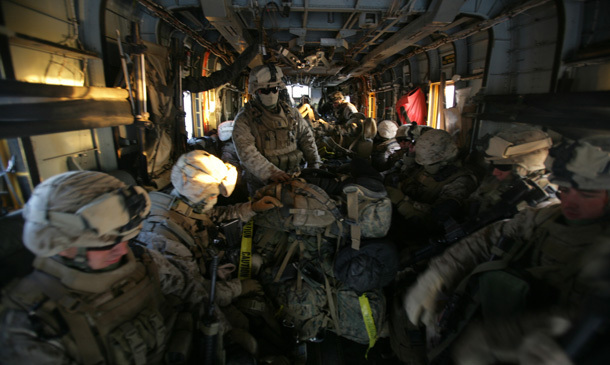 It is increasingly likely that, in this post-9/11 world, U.S. troops will more frequently be assigned to non-traditional warfare tasks, including both kinetic and non-kinetic counterinsurgency operations, rather than full-scale conventional wars with near-peer competitors. While proficiency in conventional warfare cannot be allowed to lapse, the next administration should consider the type of conflicts most likely to be encountered when allocating limited funding to procurement, training, force expansion, and other budgetary requests. For the next four years, allow the defense budget to keep pace with inflation. As previously noted, today’s defense baseline budget is higher than it has been in real dollars since the end of the World War II. This sum, if used wisely, is more than enough to ensure American military predominance while recapitalizing equipment lost in Iraq and Afghanistan, and growing and modernizing the force. The next administration should therefore keep the defense budget flat over the next four years, adjusting for inflation and fluctuations in the U.S. dollar. The substantial increase in defense spending during the Reagan administration, which saw DOD’s base budget increase by some 53 percent over five years, was followed by a sustained period of budget cuts of about 35 percent between 1985 and 1998. In contrast, the dramatic rise in base defense spending during the Korean War—DOD’s budget nearly quadrupled between 1950 and 1954—was followed by a long period of sustained but modest growth in DOD’s budget at an annual real increase of about 1.5 percent between 1954 and 1980. The latter precedent represents the better model to emulate. However, economic constraints and the almost unprecedented size of the current budget suggest that even small increases in the baseline budget can and should be avoided in the next administration’s first term. Include supplemental war funding in a consolidated budget. Long-term U.S. interests in Iraq and Afghanistan require that an American military presence will be maintained in those countries for the foreseeable future, most of the cost of which should be paid for through supplemental appropriations. However, the services have taken advantage of these ostensibly “emergency” war-funding bills to request money for significant non-war-related projects. DOD should in the future submit appropriations for the wars in Iraq and Afghanistan with the baseline request in one consolidated budget. This procedure will allow lawmakers to scrutinize the items from the supplemental and force Congress and DOD leaders to make trade-offs and hard choices when considering the FY 2010-13 defense budget priorities. Scale back purchases of weapons systems designed for conventional warfare and reorient the force based on the need for greater irregular capabilities. It is too late to make changes in the FY 2009 defense budget, but American taxpayers can save as much as $38.6 billion over the next four years by eliminating weapons systems designed to deal with threats from a bygone era—weapons and programs that are not useful in defending our country from violent extremists or the other threats we now face. Reallocate the above baseline budget cut recommendations to cost overruns in the Grow the Force initiatives and equipment reset as needed. Our recommendations will cut the baseline defense budget by $38.6 billion over the next four years. However, these funds should not be eliminated from the baseline budget. They should be reprogrammed to support Grow the Force initiatives, including related TRICARE and other health care costs, and equipment reset costs, some of which DOD can already anticipate. If necessary, approve supplemental funding to cover cost overruns in the Grow the Force initiatives and equipment reset. Given President-elect Obama’s stated goal of redeploying all U.S. combat troops from Iraq by mid-2010, it is reasonable to expect that war-related funding for that operation will decrease significantly in the coming years. The new administration must resist the understandable desire to reap a large peace dividend from this decrease in spending. Instead, lawmakers and military leaders should direct a portion of today’s war-related funding to equipment reset and force modernization in order to expedite high levels of force readiness, with a particular emphasis on the Army and the Marine Corps. This redirection of funds is consistent with Army officials’ desires to shift some of the supplemental funding—rather than eliminate it as U.S. forces are withdrawn from Iraq—to critical DOD initiatives such as reset and growing the size of the ground forces. Congress should undertake responsible oversight to ensure that these extra funds are justified. Some of the funds that will be saved by drawing down forces in Iraq will have to be spent to support the increased troop strength in Afghanistan. The United States can save approximately $140 billion over the next two years from decreased operations in Iraq while redirecting a total of $22 billion to Afghanistan over the next two years. Continue to increase the size of U.S. ground forces without lowering standards. The Army and Marines should meet their new end-strength goals without relaxing recruitment standards or retention and promotion criteria. Doing so will not be easy in the current environment. Dropping the ban on women serving in combat and repealing the “Don’t Ask, Don’t Tell” law will enlarge the pool of potential recruits and make the challenge somewhat easier. The current target of adding 7,000 soldiers and 5,000 marines per year should only be kept if it does not mean lowering standards; this will ensure that the Army and Marines do not deplete the quality of their force. Recruitment and retention standards should return to at least pre-Iraq standards. Congress must make sure that the overall quality of U.S. military personnel does not slide as it did in the 1970s. It is worth waiting a few extra years, if necessary, to ensure that the Army and Marines attract the men and women who possess the specialized skill sets needed for an effective 21st-century military. Prioritize people over hardware. Developing high-tech expensive weapons programs should never take priority over the investment, support, and development of those serving in our all-volunteer professional military. Our primary investment should always be in the men and women serving in uniform. Investing in their development—in education, training, and quality of life—is investing in the greatest weapon we have. Control cost growth in weapons systems and appoint a deputy secretary of defense in the mold of David Packard, Charles Duncan, and Don Atwood. Controlling the runaway cost growth that has occurred in weapons research and development and acquisition process over the past eight years will be critical to keeping the future defense budget relatively flat. According to a recent GAO report, the actual costs of the 95 largest weapons programs collectively increased by nearly $300 billion over initial estimates in the past seven years. A report by the Pentagon’s own business board put the growth at $401 billion. Of the 95 programs, “None had proceeded through development while meeting the best-practice standards for mature technologies, stable design, and mature production processes, all prerequisites for achieving planned cost and schedule outcomes.” The Department of Defense has been so poorly managed in the past eight years by its political appointees that if it were a private company, it would have had to file for bankruptcy. Only a deputy like Packard (1969-71), Duncan (1977-79), and Atwood (1989-93) can bring this system under control. This report will describe the overall state of the military and the current composition of the defense budget, and offer suggestions for how to build a force optimized to defeat future threats. U.S. troops have performed admirably in Iraq and Afghanistan, but these operations have left readiness and recruiting problems in their wake. The first section explores these difficulties and offers recommendations to build the quality of the force and retain skilled soldiers, sailors, airmen, and marines. The second section analyzes the defense budget with an emphasis on two areas where growth is both necessary and challenging: equipment reset and personnel costs. The final section offers a service-by-service analysis of budget priorities. It demonstrates that with proper management, the United States can build a military designed to win irregular wars such as those now being fought in Afghanistan and Iraq, and that it can operate with the same level of yearly funding appropriated for FY 2009. It also suggests specific budget cuts or additions to reach this goal. The next administration will be faced with difficult trade-offs in deciding budget priorities and orienting the force to meet conventional and unconventional threats. This report outlines the strategic constraints that the next president will face and offers the Center for American Progress’ vision for a military ready to meet the threats and challenges of the 21st century in a cost-effective manner—something that has been sadly lacking for the past eight years. Continue increasing the size of U.S. ground forces without lowering standards. Also, enlarge the recruiting pool by dropping the ban on women serving in ground combat units and repealing the “Don’t Ask, Don’t Tell” law. Slow down Future Combat Systems and cut the program’s procurement, research, and design budgets by a third over the next four years. Move forward slowly on the Brigade Combat Team model, but carefully review the operations of the Maneuver Enhancement Brigades and determine whether more are needed. Maintain funding for the Joint Light Tactical Vehicle at the current level, allowing for development and testing, but delay production in favor of purchasing M-ATV armored vehicles for Afghanistan. Cancel the Zumwalt-class DDG-1000 destroyer and build two Arleigh Burke-class DDG-51 destroyers a year for the next four years. Keep SSN-774 attack submarine production steady at one per year instead of ramping up to two per year in FY 2013. Move forward with current plans for the Littoral Combat Ship. Deploy the Gerald R. Ford (CVN-78) aircraft carrier but delay the construction of the CVN-79 aircraft carrier for five years. Cancel the LPD-26 amphibious ship and move forward with the Maritime Prepositioning Force (Future). End production of the F-22 Raptor immediately at 183 planes. Continue development of the F-35 Lightning II Joint Strike Fighter, but do not start full-scale production until flight tests have been completed. Buy F-16 Block 60 fighters, two wings of MQ-9 Reaper drones, and 69 F/A-18E/F Super Hornets to make up for the anticipated gap in fighter aircraft. Cancel the MV-22 Osprey and substitute cheaper helicopters while continuing production of the CV-22. Build more C-17 cargo aircraft. Move forward on the KC-X. Substitute MQ-1C Warrior drones for Armed Reconnaissance Helicopters. Move forward on the new long-range bomber. Cancel unproven missile defense programs. Halt deployment of the ground-based missile defense system until it has proven itself in realistic operational tests. Continue work and testing on lower-risk missile defense systems. Stop deployment of the missiles and radars in Poland and the Czech Republic until the system has been adequately tested. These recommendations would save the Department of Defense $38.6 billion over the next four years.